Oh What a Night! 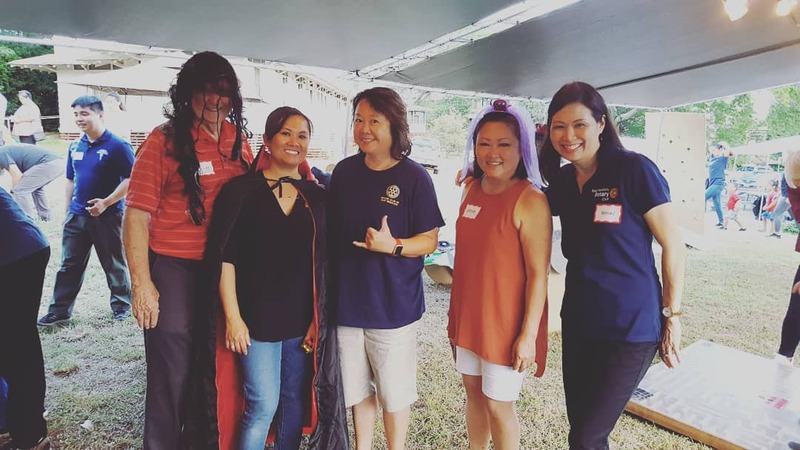 About 100 rotarians, rotaractors, interactors, HUGS volunteers & staff, Men's Leadership Hawaii volunteers, and HUGS keiki gathered together this Friday, October 26th at the HUGS facility for our HUGS Reespite Night. Keiki were treated to over a dozen carnival games, face painting, lots of prizes and candies, a great dinner, and the movie "Coco". Thank you to Rotarians Jamie Apuna, Ashli Sasano, Kelli Chun, Jim Morris, Rory Lee, Kelly McDonald, and Wendy Chang for volunteering. Thank you to Laura Steelquist for the Halloween decorations and costumes, Kelli Chun for doing balloons for the kids, everyone who donated to this event, and to Jamie Apuna for chairing. HUGE Mahalo to the Men's Leadership Hawaii for bringing all of their games, bringing and setting up the tent, and cooking the delicious dinner! Hear from Joan Naguwa, HUGS Executive Director, when she speaks to our club on November 26th!